Downe is a village in the London Borough of Bromley. It lies on a hill, and much of the centre of the village is unchanged over the last 100 years; the former village school now acts as the village hall. 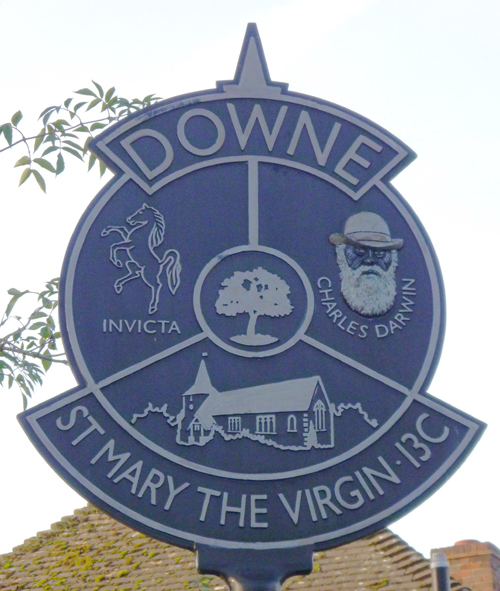 The word Downe originates from the Anglosaxon word doon, latterly down, hence the South and North Downs. The village was part of Kent until April 1965 when it was subsumed into the new London Borough of Bromley. Its most famous resident was Charles Darwin who lived at Down House, just on the edge of the village. Nigel Farage, the leader of UKIP, was born in Downe in 1964. The cache, a petling tube, is located a short walk from the sign.